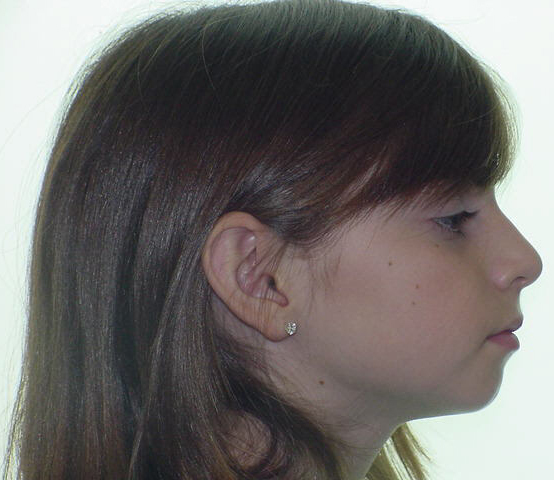 There has been research around for years demonstrating that soft-tissue airway obstruction in a developing child leads to under-development of their upper jaw and constriction of dental arches; this in turn leads to crowding and many times a backward shift of their lower jaw. The obstruction can be from chronic inflammation, swollen tonsils and adenoids, adverse tongue posturing or just anatomical thick tissue. If severe enough, it can lead us to recommend removal of permanent teeth or even surgery to re-position one or both jaws. We are also seeing that over time, this constriction affects the tongue space and can ultimately lead to Chronic Snoring and Sleep Apnea. As a practicing Board Certified Orthodontist, I have treated thousands of patients with varying malocclusions that could be traced back partially if not wholly to airway obstructions. Recently however there is a trend in our medical community to address these airway obstructions early to reduce the prevalence of Sleep Apnea and improve the long-term health of young patients before the symptoms of the airway restriction become severe. Several local ENT’s in my community have become very proactive and I believe the research is continuing to demonstrate early removal of soft tissue obstructions in the nasal airway is absolutely warranted and helps in overall development and later quality of life. 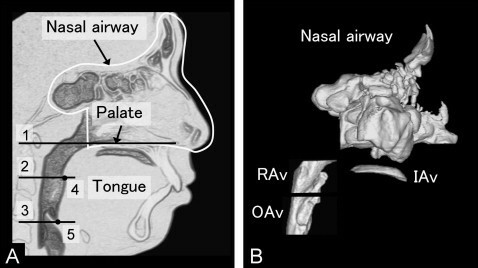 Anatomy of the Nasal Airway with computerized imaging of airway space. What we are really seeing in the literature is a merging of medicine and dental; perhaps something that is less common than it should be but nonetheless this sharing of data is now helping educate providers and push for better patient care and more successful outcomes. From my practice, experience shows that by the time a patient sees the Orthodontist by General Dental referral, much of the damage is already done. That is because most dentists gauge the need for braces by the crowding of the teeth and they tend to want to wait until most or all baby teeth are lost (which is entirely too late for more severe problems). 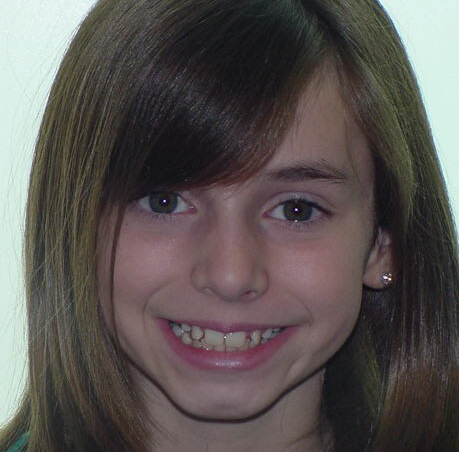 In these now adolescent cases, we use traditional braces (with or without expansion/removal of permanent teeth/surgical repositioning) to undo what we can and work to establish a new arch form with alignment of teeth while providing the best esthetics and function possible. This adolescent was referred only after once all permanent teeth erupted; patient had a history of breathing problems and chronic airway obstruction that went untreated. 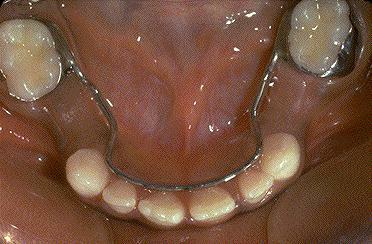 Following extensive Orthodontic treatment including Rapid Palatal (Maxillary) Expansion and removal of the upper right 2nd bicuspid; although the teeth are corrected and arches restored, stability will never be possible without long-term nightly retainer wear; following treatment, the patient was referred to an ENT for removal of excessive soft tissue for added stability. Correcting a narrow maxilla or a smaller (retrusive) lower jaw due to an airway issue can be time consuming and expensive to correct later in life; stability is sometimes based not only on early intervention and good dental correction but also on alleviating any airway construction before or after the orthodontic correction. Patients and parents of patients should understand that the development of the dental arches are usually only a reflection of the forces in the mouth; whatever causes a severe malocclusion will still be affecting the teeth following the correction. Therefore it is important to consider the airways when determining if a correction can be maintained without long-term appliances/retainers. At 7 years old, this young patient was identified as having large tonsils and an obstructed airway with under-developed upper jaw and retrusive lower jaw. Following expansion of her upper jaw, you can see the lower jaw has come forward; patient reports improved breathing and parents report correction of snoring. At this point, patient is referred to an ENT for possible removal of tonsils and will be monitor as we await the remaining permanent teeth. and they can take records to confirm and quantify such narrowing in the airways. If seen early enough, the effects of the airway obstruction can easily be corrected by expanding the upper jaw and freeing the lower jaw to come forward as well as referring the patient to a knowledgeable ENT for closer evaluation and possible removal of soft tissue. Along with expansion, the Orthodontist may even choose to set upper front teeth (which erupt around age 6 to 8) into an ideal arch form while clearing a path and opening space for future eruption of commonly impacted teeth due to this problem. 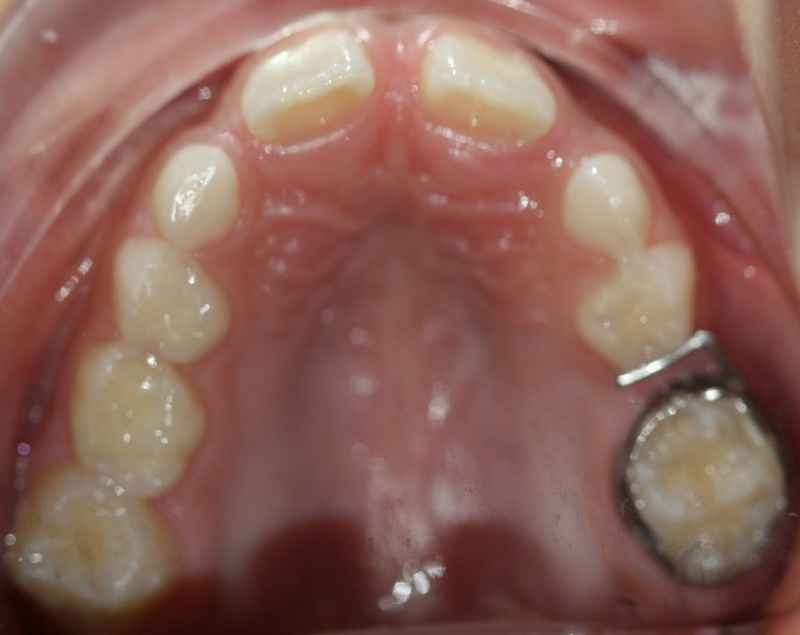 We know from the literature and from experience that many impacted canines that would require surgical exposure can be prevented by simply restoring a narrow upper arch with a fixed (not removable) palatal expander. 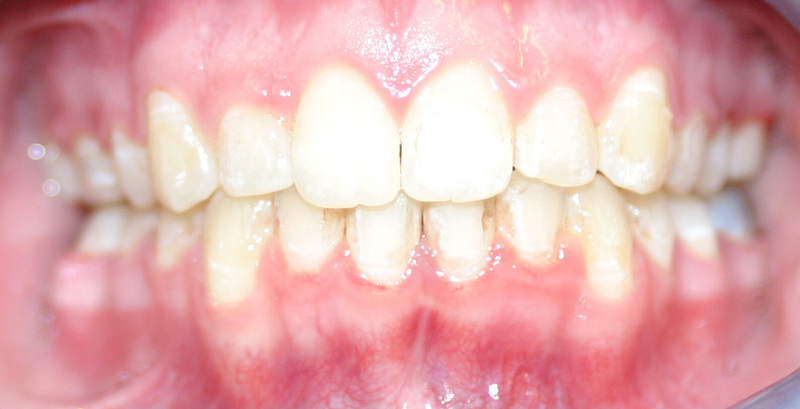 Consider the following case with a severely impacted and transposed tooth. Already late getting to us, it took expansion with limited braces in the early mixed dentition to correct the impaction and save the adjacent tooth from more damage. Note the narrow upper arch secondary to chronic airway Obstruction and Allergies. show the sequential movements to correct the impacted and transposed canine. 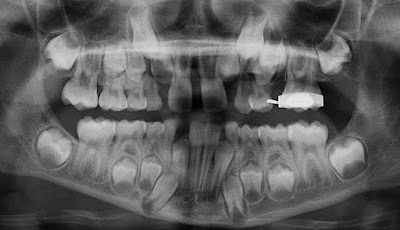 Review of sequential X-Rays shows the correction of the impacted cuspid following expansion and opening space for the blocked out teeth; the photograph shows the new smile as we now await the remaining teeth. Airways have n=been increased from the process and we expect a stable long-term correction. In a Februrary 2013 study published in the Journal of the American Association of Orthodontics (AJODO) (http://dx.doi.org/10.1016/j.ajodo.2012.09.014 ) entitled Tongue posture improvement and pharyngeal airway enlargement as secondary effects of rapid maxillary expansion: A cone-beam computed tomography study, investigators using computer tomography imaging on patients treated with palatal expansion measured the before and after airways and tongue posturing known to affect development and contribute to sleep apnea. amounts of resistance from soft tissue. This study wanted to confirm these findings but also investigate the effects of Expansion on tongue position which have also been shown to cause sleep apnea. In other words, expansion opened air ways and improved tongue posturing in children. Of course it also increases the arch length and regains space for future teeth thereby reducing crowding and risks of impactions. A more recent study published this month in the AJODO, (http://dx.doi.org/10.1016/j.ajodo.2016.10.027) was undertaken to clarify the relationships between upper airway factors (nasal resistance, adenoids, tonsils and tongue posture) and certain facial patterns seen when treating patients with Orthodontics, specifically patients with small lower jaws (Class II) v. those with excessive growth of the lower jaw or underbite tendencies (Class III). The findings revealed that the relationship of upper airway factors are different between different facial types. The data suggested that patients with small lower jaws (Class II) had significantly more nasal obstruction/resistance and that decreased width of the upper jaw measured at the molars related to an increase in nasal airway resistance/obstruction and a less favorable tongue position. Imaging showing molar widths, measured and compared to obstructive airways. Combining the results of these two papers, Orthodontists can now show definitively that not only does a narrow upper jaw cause crowding and increased risks of impaction of teeth, but it also is correlated with reduced airflow, poor tongue posturing and an increased risk of sleep apnea. First, it means all kids should be screened early by someone who is knowledgeable (Certified Orthodontist) and can see the signs of airway obstructions before problems become too severe; General Dentists are not trained to specifically identify this problem in developing children. Second, Orthodontists must not only treat the symptoms of airway obstructions but they should also include their ENT colleagues in consultation to determine if soft tissue removal may be necessary either before or after palatal expansion. Third, expansion is not just about the teeth. If an upper jaw is narrow, it can lead to a smaller lower jaw, it can lead to further airway resistance and can even contribute to Sleep Apnea later in life. 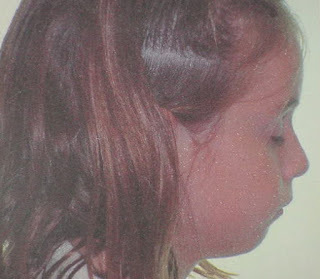 Expansion, when necessary, increases airway space and improves airflow in children. In summary, only an expert in development (i.e. 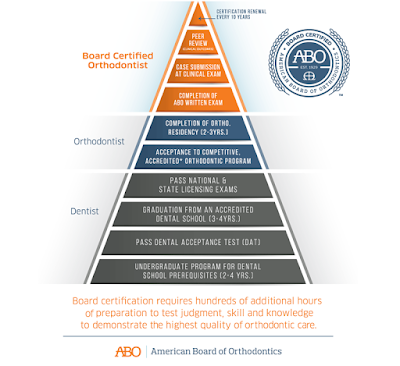 a Certified Orthodontist) is going to be able to determine when expansion may be necessary for restoring restricted airways. Even without crossbite, an upper jaw can be significantly narrow as the lower jaw is pushed backward or the lower teeth fold inward to stay within the upper jaw arch form. Waiting on a referral from someone who is not fully trained or experienced can lead to severe crowding, impactions and even Sleep Apnea. I have previously reviewed several articles concerning Invisalign and other clear aligner systems used to move teeth and there is a fair amount of debate at the specialty level of Orthodontics as to how much we should be using these aligners and how they are abused in so many inexperienced dental offices. In fact, previous studies have shown Invisalign to have a dismal 41% mean accuracy of tooth movement with a range from 18% to 47.1% (j.ajodo.2007.05.018;www.ajodo.org) and mean percentage of single tooth movement goal of only 57% (j.ajodo.2013.10.022). Last month (April of 2017), a new article was published in the Journal of the American Association of Orthodontics that confirmed previous findings. The finding s of the new article from April 2017 (http://dx.doi.org/10.1016/j.ajodo.2016.09.022) , are summarized below. Traditional braces correct 100% more of the overbite than Invisalign on average. Invisalign is only 50% as effective as traditional braces in correcting overbite. So relative to braces, Invisalign is half as effective and therefore not clinically sound method to treat when we can treat 100% more with traditional braces. And this is only one part of a malocclusion a patient may have. 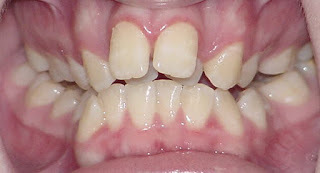 Another area of malocclusion was also evaluated; mild anterior openbites. This study only looked at patients from three Invisalign offices that had already filtered out the moderate cases for surgery (the author does not state if these discounted cases could have been treated with traditional braces or what those patients did for treatment). 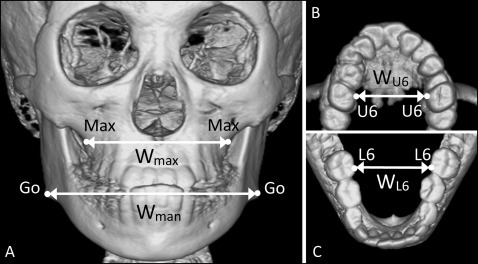 Even with these more moderate to severe cases not included, this study shows that Invisalign cannot intrude or push teeth back into the bone as braces can, in fact all of the bite closure for even these mild cases was through folding the incisors back and down; no mention was made as to the effects on the gingival display (gumminess) and no long-term information was gathered to evaluate for relapse. This is especially a weak point since these cases (and extrusion of teeth in particular) has been shown in Orthodontic literature to relapse over and over. In other words, if the doctors didn’t take post-Inivisalign records (for instance the results were not good and they didn’t want to have them in the study), they were simply not included in the study. So we can safely assume this study is full of the best cases only with any failures filtered out of the averages. But even with the results skewed to the most successful treatments, Invisalign is simply not close to the effectiveness of traditional braces. They are bound by the limitations of a removable tray that has to be loose enough to be removed and over time, fatigues and becomes essentially inert. Even Invisalign studies show that any tooth moment occurs the first 48 hours of the tray and the next few weeks really show no movement. This is a clear sign that tray cannot produce the constant forces necessary to make full tooth movmennts. So if the research is so plain and clear, who is pushing Invisalign to the public? The problem now stems from profit-based corporate companies like Align Technologies (Invisalign) and other brands such as Clear Correct and Smile Club advertising directly to the public as if Orthodontics is no different than a trip to the salon and similar to whitening your teeth. Doctors now invested in Invisalign (such as those in this study), also will make statements suggesting relative success in corrections without telling the public that 50% success means 50% failure when compared to braces. I wouldn't accept a 50% in a grade from any of my four kids and I certainly wouldn't be bragging about a 50% result v. another Orthodontist's cases but that is exactly what Invisalign and Invisalign doctors are saying and many times it's because they know what the public wants and don't want to lose business even though they know there is a better treatment. In fact, Orthodotics is very complex, so much so that it takes two to three years of specialy traingin After dental school to be called a Specialist or Orthodontist. Companies will lead you to believe a computed scan with a tech can plan and align your teeth equal to traditional braces and this is simply not the case. Consider sticking a pencil into a soft wax candle jar. Now imagine simply pushing the pencil over with finger pressure; the pencil will move but will tip. Now grab the pencil tight and try to move it completely sideways through the wax. This will illustrate the difference between Invisalign (tipping) and traditional braces (true root movement). Without the later, there is no way to correct teeth in all three dimensions and any correction from tipping will likely lead to significantly more relapse. So are so many doctors now advertising Invisalign? It is all General Dentists can do without training for braces. Orthodontists are losing referrals to General Dentists who now believe they can treat their patients and keep everything “in-house” so they are trying to keep their patients. Advertising by a Billion dollar public company is telling patients that clear aligners can give them a smile (though they neglect to talk about function/health) and that braces are essentially “old technology” and not necessary. Align Technologies threatens lawsuits against criticism of their product; they are protecting their profit by any means. They also pay doctors to use their product by offering free advertising, referring patients directly to doctors that treat more with Invisalign and they donate to all levels of the dental organizations. 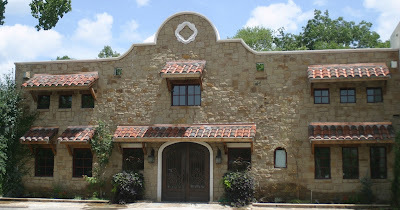 There is a reason that all dental offices in the state of Texas must be owned by a licensed dentist; only a dentist can be truly held accountable for dental care. Companies have only one primary objective: profit. IF they can get profit from a great product then by all means, good for them. But if they rely on borderline false advertising or advertising by omission to push their product then the patient gets compromised treatment that will lead to relapse, recession or bigger functional problems years later. Patients should always ask their doctor: Is this the best treatment? How would braces be different than aligners? Patients should also avoid any doctor who only offers Invisalign since we know from the literature that Invisalign is only 50% as effective as braces for even minor movements correctible by traditional braces. If a patient accepts to treating to a lesser standard without having to wear braces (and is aware of any risks of functional disturbances in their occlusion afterward), then there is no problem. I personally would never treat and leave a patient in a functional malocclusion out of pure liability because I plan on practicing for many years but if a patient wants this and goes somewhere and they disclose the limitations then at least it is an inform decision. How do I know my General Dentist treated me to a Functional Bite? The best way to check your bite after treatment with Invisalign by a general dentist is to have a certified Orthodontist see you after treatment. Be up front, let them know that you have treated with aligners but that you just want to make sure there are no big issues functionally. Usually, a good Orthodontist will just keep to the big stuff; he or she is not looking to re-treat patients or openly criticize someone else’s work, but they will now be responsible for identifying any problems and informing you of potential issues. Keep in mind, aligners are rarely going to provide ideal occlusion simply due to the plastic between the teeth and due to any jaw shift that changes the bite from before the aligners to after (all trays are made from the initial scan and may only be altered once during the entire treatment). Regardless, large problems that can lead to recession, damage to teeth and damage to joints will have to be disclosed. From there, you can decide what path to take but at least you will know. Dr. James R. Waters is a 1996 graduate from UTHSC Dental School in San Antonio, 1997 graduate of Advanced Dentistry from the UNMC in Nebraska and the 2001 Valedictorian graduate from the prestigious Saint Louis University Orthodontic Program receiving the J.P. Marshall award for clinical excellence in 2001. He holds a Bachelor’s Degree in Science, Doctorate in Dental Surgery, a post-doctorate certificate in Advanced Dentistry, post-doctorate Degree in Orthodontics & Dentofacial Orthopedics and a Master of Science Degree in Orthodontics and is a Diplomate of the American Board of Orthodontics. Dr. 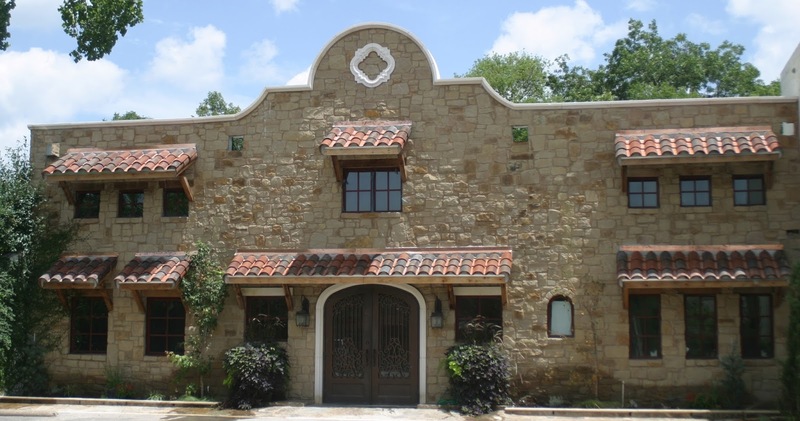 Waters and his wife of 21years live in Austin, TX with their 4 children where he has a thriving, multi-faceted Specialist practice with locations in Steiner Ranch and North-Central Austin. You can learn more about Dr. Waters at BracesAustin.com. Why are Holding Arches important? Why is it important to keep baby teeth and hold space if they are lost? One of the first things many parents run into at their child’s dental visit besides regular cleanings and the occasional filling, is the question of removing baby teeth v. putting more money into saving them. They may also be told that space must be maintained following loss of a specific baby tooth. Before getting upset and thinking your Dentist or Pedodontist is trying to pile on to your child’s treatment plan, I want to explain the sequence of how permanent teeth erupt and how the baby teeth are important in the eruption of adult teeth (and overall alignment of teeth). 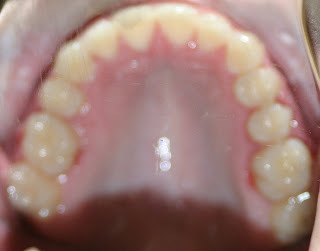 So generally lower baby teeth erupt from front to back with lower incisors erupting first (usually around 8mo to 12mo) and baby second molars erupting at around age 2yrs. The chart below gives an overall summary (note the wide varied eruption estimates revealing a wide range of “normal” eruption pattern. You will notice that there are no baby premolars (bicuspids); there are only 20 baby teeth (10 upper, 10 lower) as opposed to 32 adult teeth (16 over 16). This will play a part in development as I explain later. But for now, the important thing is that most children will have their full complement of baby teeth from age two forward. 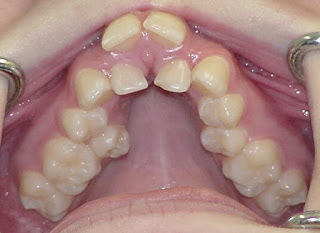 When the permanent teeth begin to erupt at around age 6, the first to erupt are usually the same as the primary teeth; that is the lower front baby teeth get loose (ideally) and the lower permanent incisors erupt to take their place (usually starting out behind the baby teeth only to be pushed forward into the arch by the tongue). What parents may not realize is that the next permanent teeth to come in actually come in behind the last baby molars around age 6 to 7. The importance of this may escape most people but what this means is that all of the space for the future permanent teeth is set by the time the permanent 1st molars erupt around age 6 to 7; permanent canines and premolars won’t erupt for another 4 to 5 years. Any loss of space from permanent molars drifting forward will increase crowding of future teeth and can reach the point of requiring removal of teeth to align. Also, since the permanent premolars develop under baby molars (remember, no baby premolars), it turns out that the baby teeth actually hold more space (termed the “Leeway Space”) since the premolars are smaller than baby molars overhead. In fact, maintaining this Leeway space can make save up to 3mm per side and can make the difference in a borderline extraction case of braces later of whether we remove permanent teeth or not. Holding this space can also help to prevent severe crowding and/or impaction of teeth as they try to erupt. To illustrate this, consider the following patient where an upper left baby 2nd molar was removed early and inadequate efforts were made to hold space (there is actually a bar attempting to hold space however these un-lateral bars are insufficient to hold space in my experience as this demonstrates). Notice the space on the right in front of the banded tooth; this space of 3mm is left over from a 10mm tooth that was removed. The bar was placed late and space continued to be lost. In the radiograph, you can see the severe crowding under the lost space (in fact there is crowding throughout the arch due to a general narrowness and under-development of the arches). 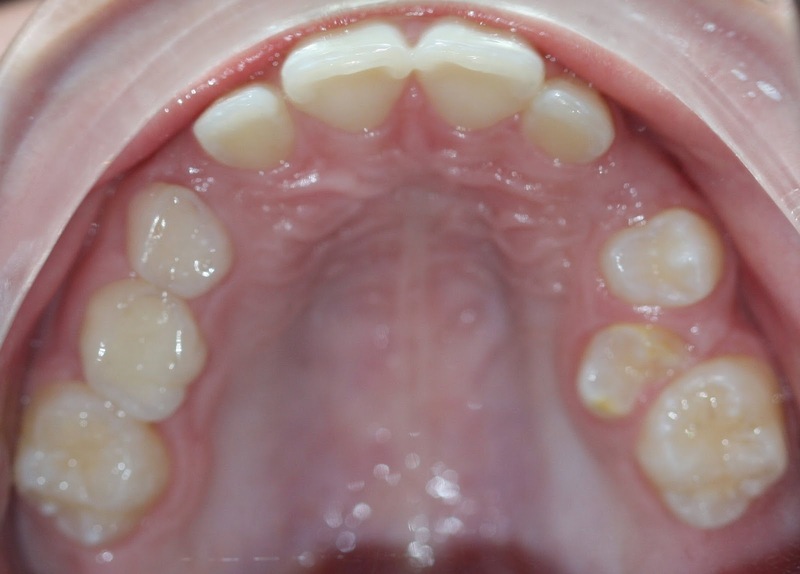 Following expansion of the upper arch to restore the arch size and an early effort to re-open some of the lost space, you can still see the lingering effect of this lost space as the premolar erupts more into the roof of the patient’s mouth. It may seem unfair that that the molars will drift forward when baby teeth are lost however this is why the baby molars are larger than the underlying premolars; because the permanent teeth drift forward, Leeway space is always lost during the natural eruption of teeth so having extra space gives time for the premolar to erupt before it gets blocked. For this reason, anytime a baby molar (especially a baby 2nd molar) is lost before the permanent teeth are ready to erupt or even if we need to use the Leeway space, your dentist or Orthodontist will likely recommend a “Holding Arch” to maintain the Leeway space. In the lower arch, the holding arch is a bilateral holding arch from permanent molar to permanent molar. In the upper arch, we generally prefer a wire running across the roof of the mouth extending from molar to molar. 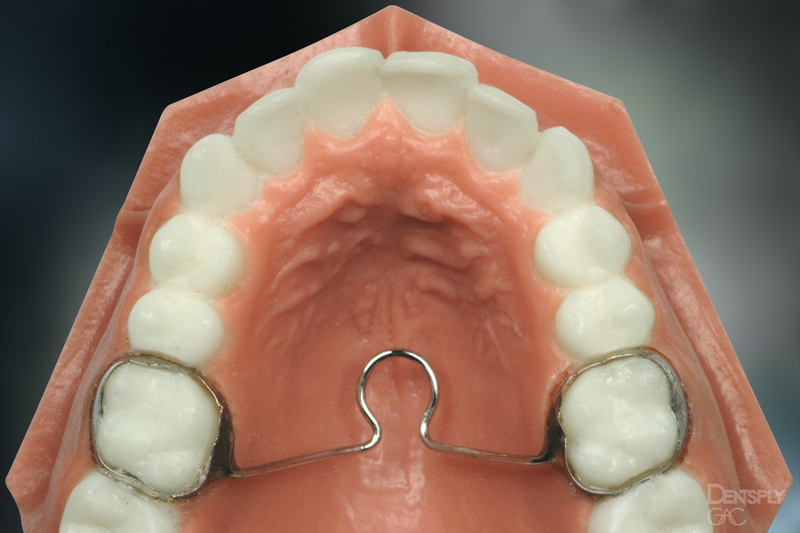 Believe it or not, a simple holding arch as those shown above can easily prevent the need to remove permanent teeth later and can reduce crowding significantly. So when your Dentist, Pedodontist or Orthodontist recommends a holding arch, you can be sure they are looking out for the best interests of your family. Likewise, if there is a chance to save a baby tooth with a Stainless Crown and baby root canal (pulpotomy) instead of removing it and having to place a holding arch, you can see it may be worth the cost, especially if that tooth in question is supposed to be there for a few more years. Although I have addressed the benefits and sometimes need to re-shape teeth as part of orthodontic treatment and following removal of braces, I wanted to present the public with more specific studies which looked at surface roughness following interproximal reduction of teeth, re-shaping of teeth and (in the 2nd study) following removal of bond cement when braces are removed. I wanted this information out there for those few parents and patients that are nervous or concerned about the enamel following braces, specifically following any re-shaping or polishing of the enamel. In the recent April 2017 American Journal of Orthodontics & Dentofacial Orthopedics, there was a study published (Meredith, Farella, Lowrey, Cannon and Mei; AJODO.2017.04.151) which used Atomic Force Microscopy to analyze the enamel nanotopography (surface of the enamel at a scape of 1/1,000,000,000 of a meter or a nanometer) following reshaping of enamel during Orthodontic procedures. Without going into minutia detail, this prospective study used 64 teeth and performed various levels and types of re-shaping with diamond strips, diamond burrs (handpiece) and several polishing discs. Control teeth (with no re-shaping or polishing at all) showed normal enamel roughness or ridges of 149 +/- 39 nanometers (1nm = one billionth of a meter). 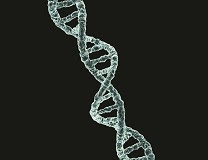 To give you a sense of the scale this study was measuring (and the extreme minimal effect of braces to teeth), consider that Viruses are 30 to 50nm in width, DNA is 2.5 nm in width and a single atom is .1 to .3nm in width! So before you see the results, remember the scale we are employing just to detect a difference in the enamel surface from pre to post-orthodontic debond and polishing. So the Results showed the initial re-shaping with diamond burs (handpiece) all produced rougher surfaces with values from ridges of 702 +/- 134nm, various strips ranged from 501 +/- 115nm down to 318 +/- 50nm with fine curved discs showing ridges of 224 +/- 65 nm. The smoothest enamel was seen following a series of Sof-Lex discs leaving surfaces with ridges averaging 37 +/- 14 nm. Enamel has natural ridges at the nanometer level; teeth are not glassy on the surface. Your Orthodontist should be using round discs to polish teeth (Sof-Lex discs produced the smoothest surfaces, 3x smoother than normal average enamel). Sof-Lex discs can polish the surface of enamel to leave ridges and valleys the less than the height of a single virus or only 300 atoms high! How does de-bonding and cleaning enamel after braces affect surface roughness? 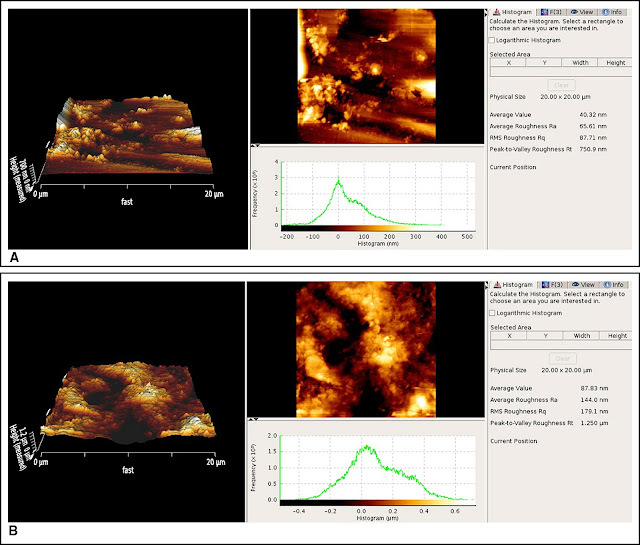 I want to also include a summary from another similar atomic force microscopy study looking particularly at the surface of enamel following de-bonding (after braces are removed) also published in the AJODO (Mohebi, Shafie and Ameli; AJODO,2017.03.151). In this prospective study, 30 teeth were bonded and de-bonded using composite cement and then the remnant cement was removed using different methods; a white stone bur and a tungsten carbide bur. 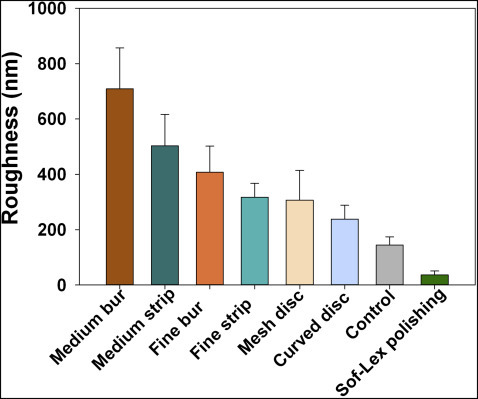 Results revealed no significant difference in surface roughness following removal of the remnant cement between the groups however the Tungsten bur was significantly faster/more efficient. The surface roughness was increased when compared to the control teeth (average 87.7 nm) v. post-composite removal (average 179nm) which the study pointed out was known to be the case as investigators have repeated previously. Sof-Lex polishing discs with slow speed handpiece. The public should keep in mind that it takes a fairly strong bond between bracket (braces) and the teeth to be able to move the teeth and the roots. I always compare root movement to sticking a flat knife into a tub of cold butter and trying to move the knife sideways while keeping it upright. This is exactly why clear aligner trays such as Invisalign, Clear correct and even Orchestrate3D (the specialist version of aligner trays) are so limited in their overall movements and why studies from the AJODO have repeatedly demonstrated the poor accuracy of tooth movements with trays (anywhere from 18% to 44%). Of course the trade off is that fixed braces must be cemented well enough to withstand not only forces of movement but also forces of mastication; it should be no surprise that we expect some (extremely) minor surface roughness immediately following debond. How do I Personally clean cement from braces? Ever since I have been in practice, I have always removed excess cement 1st with a plier to scrape any large remnants, then with a Tungsten Carbide bur with a hand-piece to remove the more stubborn remnant composite (I use 3M Transbond cement for brackets/braces and Fuji II Glass Ionomer cement for bands) then I follow every case with a series of Sof-Lex discs (I use the soft color-coded system from black to dark blue to medium blue and finally with the super-fine light blue). I think my experiences as a general dentist years ago, prior to specializing in Orthodontics, instilled in me a standard to follow. In fact, so many times I had seen patients treated that came back to me with terrible scarring to the surfaces of the teeth and it always frustrated me to think of all of the work and time involved with Orthodontic treatment only to see the surfaces with gouges and scratches that could have easily been either prevented or polished (most of which I ended up polishing afterward for the patient). Because of my experience and history as a general/cosmetic dentist prior to Orthodontics, it was no surprise to me to see the results from these recent studies and I am pleased the literature makes recommendations for the good of the patients that I know have worked for me and my patients for over twenty years.